A unique venue situated at the heart of Bloomsbury. 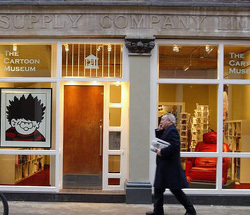 The Cartoon Museum celebrates the best of British cartoons, caricatures, comics and animation. Its innovative exhibitions fill the walls with great sources of laughter – a perfect place for all kinds of venue hire – wedding receptions, corporate events, parties and celebrations. The museum venue functions as a public museum from Monday to Saturday from 10.30am to 5.30pm and on Sundays from 12.00pm to 5.30pm. 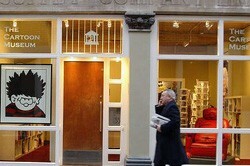 The venue is generally available each day for private hire from 5.30pm until 11.30pm. Please allow 1 hour set up, and half an hour close down. The venue is licensed for up to 200 guests for a standing reception or up to 50 guests for a formal sit-down meal, 70 for a standing supper. Museum venue hire covers the three exhibition spaces and the use of the kitchen. From the 15th July to the 1st November 2015 the venue is hosting a very special exhibtion called “Alice in Cartoonland” and Suzanne James have some wonderful Alice in Wonderland themed menu ideas at the ready! Read more here.